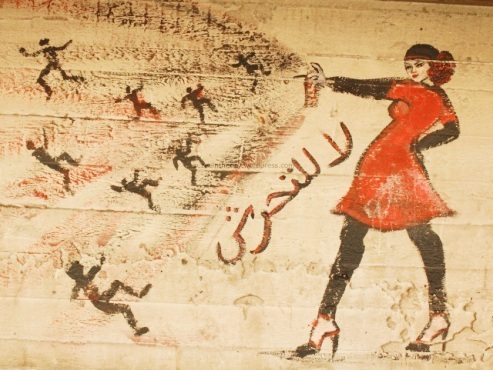 Graffiti artist Mira Shihadeh makes a strong public statement to stop sexual harassment and violence against women in Egypt through her artwork. This work is part of the political graffiti on building facades facing Mohammed Mahmoud Street in downtown Cairo. It shows a woman in a red dress brandishing a spray can (perhaps mace or something else) against her assailants to keep them away from harming her. Read more in the Women News Network.